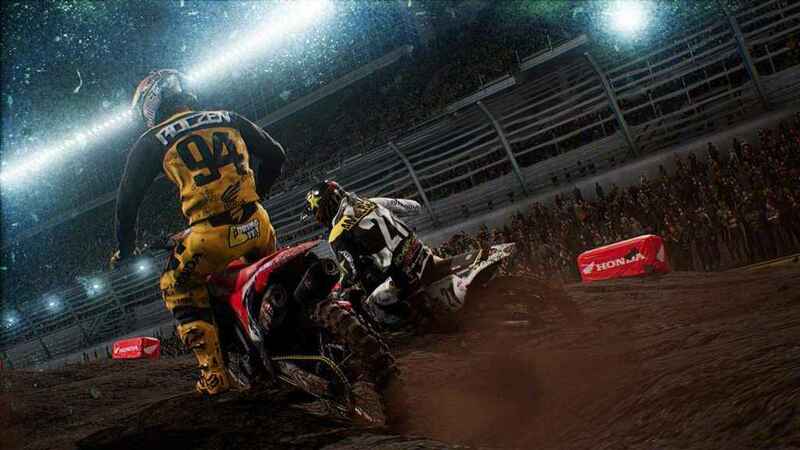 Monster Energy Supercross: The Official Videogame is based on the AMA Supercross Championship based in the United States. With Milestone S.r.l. picking up the licence to create an official game for the championships, Milestone took the major championship tiers and incorporated them into a game. 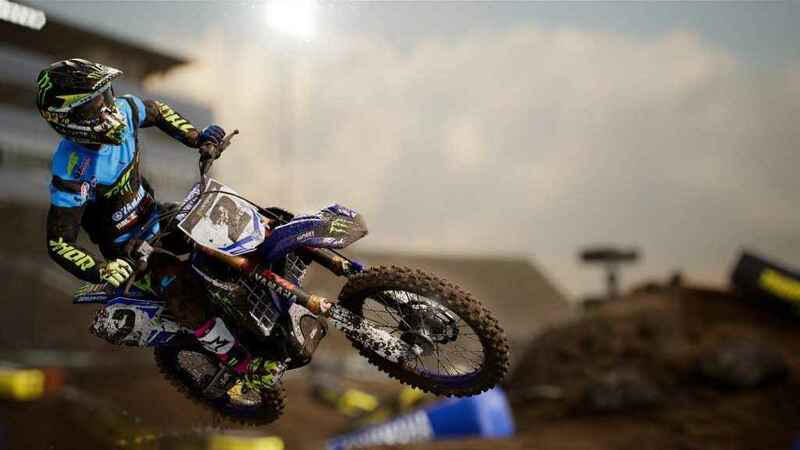 While allowing the user to create their own character, all of the official riders are present in Monster Energy Supercross, including the teams they ride for and their sponsorship logos. So much detail has been put into the bikes and decals that it looks fabulous. 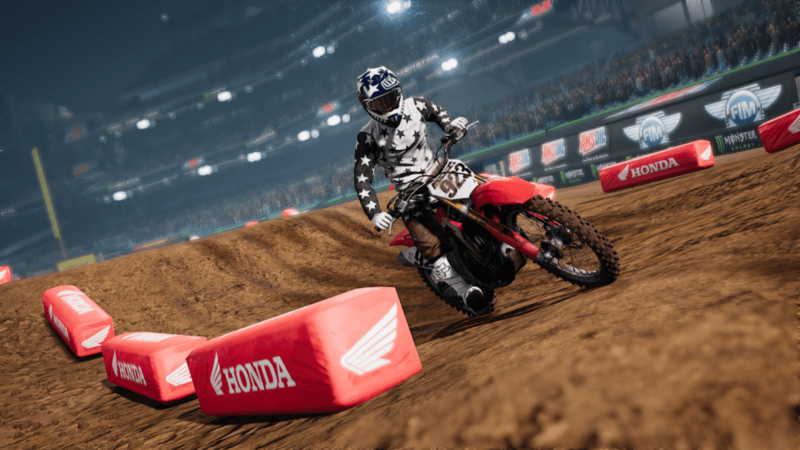 With the 38 riders and six teams, the racing game also sports all of the stadiums and tracks available – of which there are 17 to race on across the three main championship classes - 450SX, 250SX East, and 250SX West. Hoping straight into a 450SX race is extremely difficult, and if you're new to the genre then it takes a lot of practice before you can start keeping up with the brutal pace of the AI. Even at 250SX, it can be a challenge. The handling of the bikes is such that unless you read the tutorials, you would not have known that using the right thumbstick would help you transfer the weight to your rider – so there’s a tip! The handling is certainly a challenge, but when the tutorials are nothing but pictures and text on the screen, it doesn't give new players any confidence into learning the game at the start. Consequently, going straight into a time-trial to learn the tracks and – most importantly – the handling of the bikes is the only viable option. Every track is based on their real-life counterparts; this means that the majority of them are open-air and open to the elements to change the track conditions. Unfortunately, the track conditions don't change but are consistent throughout the race and wet races make a big difference to how you approach every corner. This isn't a bad thing due to the length of races being fairly short anyway, but for longer single events where you can choose the options and have very long races (average of 20 minutes on Realistic length), having a change in weather from dry to wet would bring another dimension to the game. There is a good mix of indoor and outdoor stadiums, however, so having wet weather with a closed environment is an option that can be passed. 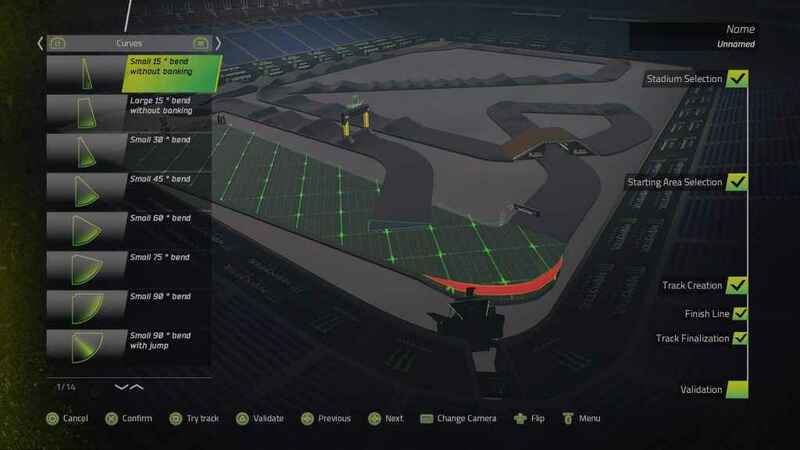 In Monster Energy Supercross: The Official Videogame, you get to race all or some of these tracks when playing a championship; this is where you play a single full season on the class that you select. 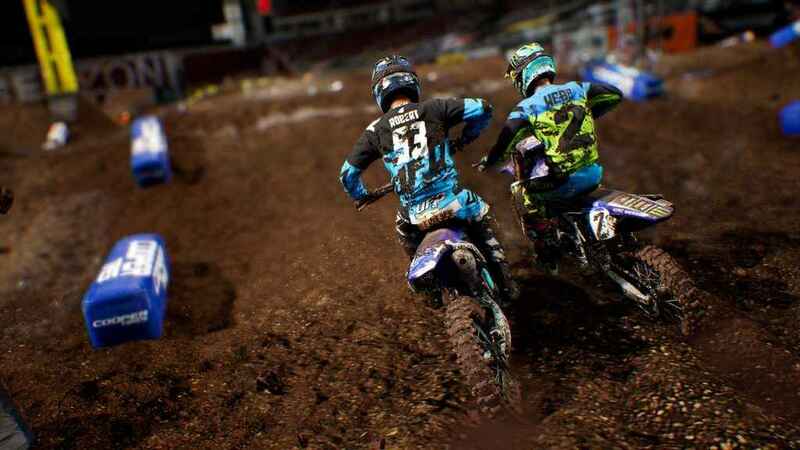 If you decide to embark on a career then you play all the tracks available in the game, but you would need to rise through the ranks before getting out of either 250SX East or West. Before starting a championship or career, you're thrust into the character creation screen where you can choose a multitude of variables to make your character stand out from everyone else, namely decals and bike options. However, when it comes down to the rider himself, the faces available are limited. Despite not seeing your character's face during the races, they're ever-so-present on the podium and, but the characters – especially their faces – look awfully disjointed and very creepy. They look fine on the bikes and in the menus though - except for the faces that is. But that's the only criticism for your avatars as the bikes themselves look incredible, and a lot of attention to detail has been put into them, including the designs and options available for customising them. You can change handlebars, bar pads, hand grips, hand guards, suspensions, exhausts, brake discs, rims, and tyres! All of these have subsections and manufacturers too to change not just the decals but the model itself, giving the player a massive array of customisation to make their bike the way they want. It's a breathtaking assortment of customisation that Milestone is renowned for and it's great to see them continue this content piling into a base game where most other companies would do otherwise. Your character has just as many customisable options too meaning that playing online you'll be hard-pressed to find anyone with the exact same layout as yourself. But the details don't stop there, the stadiums and the tracks are also highly detailed. When starting a race the track looks fair and quite flat, but as the race continues, deep trudges start piling up where the bikers turn, trenches start accumulating where paths are taken. In the wet, this is ever more present. These trenches can make a huge difference later in the race which makes turning easier or harder, but in a dry race, the differences typically aren't much unless playing on a realistic length. As the career (much like any other racing game based on an official licence) has a limited number of tracks, Monster Energy Supercross: The Official Videogame would have become too samey and boring ever so quickly, but with their creative flair, Milestone has created something to improve the longevity of the game; and that's the Track editor. While having a championship season or a time-trial is all good and well, and is the staple of any racing game at their heart, Milestone has done a major service to, not only this game, but to this sport by including an intuitive and well thought out track editor. You would be forgiven being given only a few options to create your tracks, especially due to the potentially complicated nature of Supercross tracks as a whole, but Milestone has thought of almost everything, from various degrees of jumps to bridges, start positions, and bumps. There is such a large variety that no one track will ever be alike. Being able to create a track is one thing, but being able to make it decent to race on is another, and there's a quick “play” option for you to test your track before uploading it for others to race on against the AI or even the community at large. One major caveat is being able to build a course that does not break the AI. Having jumps with a cross section after it can sometimes pull the AI into turning the wrong direction. If you have a cross-section that was passed by earlier in the lap and the AI hits that mark, the AI can potentially go into an endless loop on the same lap. Funny to see, but not useful in any form at all. If you were to use the track online then the issue is negated and can make for some funny situations, especially when you have two jumps cross paths at the same height. Bridges can be quite hit and miss when it comes to placement. At times the path is not accepted despite being clearly within the bounds of where it should be, but then there are also times where placing the bridge over a section isn't accepted either. It can be quite hit and miss but eventually, it will work if placed almost exactly 90 degrees. Milestone S.r.l. can be proud of the game they have put together. For an official product, Monster Energy Supercross: The Official Videogame is a solid entry and makes a mark on an otherwise barren genre. 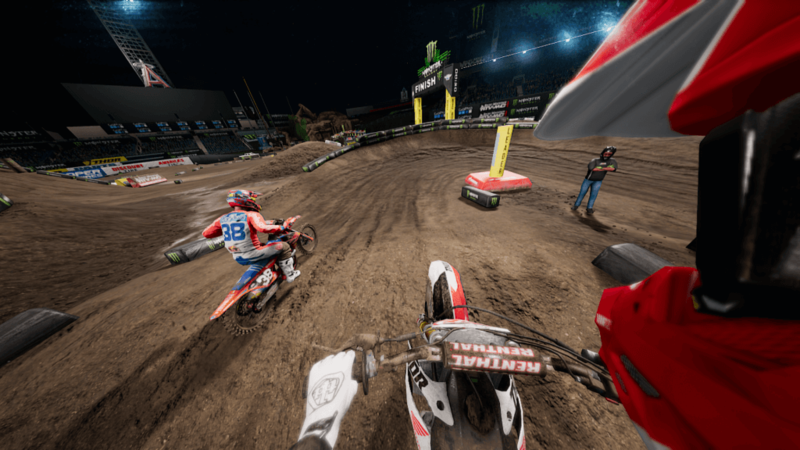 If you're a Supercross fan then you'll easily get knee deep into the track editor and certainly dirty your opponents online for getting to the finish line first. For everyone but the Supercross fans, you might have fun online and the track editor, but the AI is so brutal at times it may leave you a little frustrated. Monster Energy Supercross review code provided by publisher. A solid first entry in the series. If you’re a Supercross fan then you’ll easily get knee deep into the excellent track editor and have good fun hurtling around its muddy tracks.